Decorative illumination has the power to transform any residential or commercial building. It accentuates architecture, adds mood and can be as important as any significant furniture piece. But what if you could combine the two? 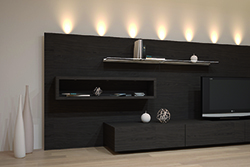 With LOOX – the innovative plug and play LED furniture light system from Häfele – you can. The product of several years of Häfele engineering and development, LOOX is being used by furniture manufacturers around the globe to set their designs apart. Our motto is “plug and play”. LOOX has a driver with an integrated switching function that makes a direct connection to your most frequently used switches such as push switches; sensor switches; dimmer switches and motion detectors. It couldn’t be easier. Häfele has a wide range of LED lights available from stock that can be combined in many different ways to compliment the LOOX program. The standard plug in connection makes it child’s play to install the lights into furniture, which means they can be retrofitted by the installer, or by the furniture buyer himself. LOOX gives you a beautiful lighting solution that’s future-proof and guaranteed to the highest safety standards.